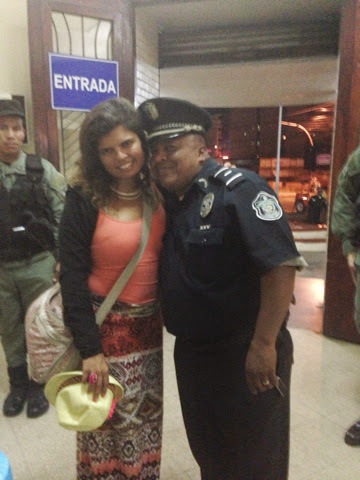 When I came back from Colombia, I had six hours and one place to go...the police station. The thought did cross my mind, "Do I really have to stop there?" "Can't I just get some food and relax before my flight?" Instead of following my gut feeling, I just decided to dive into more disrespect and attitude. The reason for my visit came from a small lost bag including a necklace, bracelet, and some headphones. It was lost or stolen near the small market in this area of town(not a great area), but close to the church. Anything lost or stolen has to have documentation according to my travel insurance. So, I figured I could go inside and get a report and be finished with Panama law enforcement....no. Now when it comes to foreign cops, I am usually pretty good with talking to them. This was the case when I arrived in the police station. There I was making my report-happy, smiling, and making jokes. The police officers were respectful, kind, and concerned-two men specifically. They asked me each and every detail and I provided clear answers to the best of my knowledge. The cops were all their in some training and were eating food. They offered me a box and we were sitting and eating together. A short man comes in named Manny. He is suddenly in love and starts making this inappropriate gestures and I am laughing it off. Everyone is laughing it off. It's just funny as he bent down on his knee and asked me to marry him when he's already married. He offered me a ride to the airport and clearly I declined. His entertainment made me smile and forget about Panama men being arrogant and rude. Instead of helping out, he just left and said, "Good luck." When those two men were writing my report, I thought I would be out the door in five minutes. My acting debue was finished and I wanted to eat something and leave-that's it. These two guys tell me that this is a special case so I need to be taken to a different office. From the get go, it starts off bad with these two officers. They are confrontational with huge egos present in every inch of their body language. The current police officers said, "Don't worry these guys will take good care of you and get you what you need." The four guys all waived goodbye and I stared out the window watching things slowly go downhill. When we arrived at the office with no documentation, the man asked me to repeat everything again. So that is what I did I went over all the details again and he told me I needed a police report. Well that is why I went there to get a police report. Until he said, you have to go to another office. This is a total of two hours at this point. Then in destination three it reached three hours. There is some priority for an American, but when they people behind the desk sees you are one-all time stops. Now, a new breeze was coming in my direction- a fresh female gust of wind. She was not happy to see me and she did not want to help me. It did occur to me, "Do I really need to go through all this? Just leave and go to the airport!" Sometimes it feels like I enjoy being a masochist pushing myself to the core to see how strong I can be. This lady was annoyed with my presence and asked me about the details of the incident. It takes her 15 minutes to get to the counter and then she is just standing there with no response to questions and completely rude. Standing next to two male cops, this her opportunity to prove her female authority in front of them. When she asks for the date, I tell her it was seven days ago. She throws my sheet to the side, shakes her head and says, "That's not possible-it's too late." I say, "But I just spent three hours to get a report and the guys at the original station took the report and accepted it. She has her back turned to me at this point and I am becoming very upset with this behavior(this is the worst way to get to me) by not acknowledging me at all. This time I did not stay quiet and respectful, but I spoke up for myself. "You can not treat people like that just because you are trying to prove yourself." It's very sad that you have to act this way." I said nothing more and I stormed out feeling angry and disappointed. I put my trust into these people again and they completely wasted my time, really? In my opinion, it was possible, but she chose to exercise her authority with the "Princess American." This felt just like Morocco, which is again why I cried for the second time on my trip all over this Panama treatment. It was so uncalled for and unjust. They crossed the line from kind to ignorant and self centered. There are other examples where I feel this discrimination from them as if they don't like Americans at all. what it feels like for a person of color or different ethnicity experiencing discrimination. It's such an awful feeling when you are in a culture with such disregard and disrespect towards your being. You feel like the outsider and oh what a feeling it is. It's like God gives me these experiences for growth. Clearly I live in America in a diverse city where I hardly experience discrimination, but when abroad I learn about what it's like. Everything is a learning experience- everything. It's a set up by God to push my own limits to learn to the maximum to assist others better. The Americans will tip and you don't even serve them-not cool and not okay.